I am coming to see that the best medical advice – whether dietary or long-term medical – probably comes from one’s body, itself. * Scientific studies and research findings are important to set us in the right direction, generally. But that information is like a global map – aggregatized, and with a wide view. It may or may not have the details to help you navigate the streets in your particular city. You’d do well to tailor any general dietary advice to meet your body’s particular needs, and those needs change, continually. Even if you participated in a scientific study, the published findings presented will also contain a lot of information that isn’t yours. At the opposite extreme, modern medical lab tests give you a snapshot of a specific moment in your body’s life. Most of us don’t have lab tests done until there’s an indication of a problem and even then those numbers can change quickly depending on the intervention. What lies perfectly in the middle of these extremes and accessible 24/7 is your body, itself. It has all the exact, personal data you need to make healthy choices about food, rest, and even who you hang out with. The indicator is how you feel about something. The key is to quiet your inner critic, media messages and other non-healthy voices enough to hear your own, healthy internal ones. After going a month without sugar, I began to hear by my body’s messages more clearly with each passing day. For much of my life, the voice I heard telling me what to eat (from my intestinal micro biota that crave sugar) wasn’t mine. The “sugar bugs” and my fears about getting enough food to hold me to the next feeding were calling the shots. AS I starved out the sugar bugs and they clamored less, I could hear my body tell me what it wanted to eat instead of sugar. You’d think listening to your own body would be a given. Unfortunately this driven-by-other is actually our societal norm. We allow Big Corporations to make huge profits no matter the cost to human or planetary well-being. We already know we are forfeiting our health, mental function, and possibly our very lives by letting this continue. It takes courage to face this down. But we can do it. Take lots of smaller steps that add up to big shift. Here’s an example of starting with small steps. The other morning at breakfast, I could feel an internal conflict. I needed to eat, but the food I think is healthy for me didn’t appeal to me. I decided to eat an apple with peanut butter (from peanuts that I’d ground at the health food store) and rye crackers with a tofu salad I’d made. But then I looked at how much sugar (glucose) was contained in all that and reduced my portions. After two slices of apple, I “heard” a voice that said, “That’s enough apple.” And then my mind said, ”If you only eat a few bites now, you’ll be hungry when you’re working and won’t be able to get more food.” So I sat there a little longer and listened internally. I felt another impulse urging me to eat the entire apple. A wordless battle was raging and I had a ringside seat. I didn’t try to stop it, I just listened to it to get to know the contenders. I wound up eating the whole apple but clearly feeling the results of doing so. This time I didn’t get upset with myself. It was an important step in the process of getting to know my body’s signals. Then, the next day, my body clearly asked for better water. The best way I can describe it is a sudden distaste for the filtered municipal water I’ve been drinking for years and a sudden intuitive interest in cleaner water. I had recently replaced the filter so that wasn’t the issue. True to the way this magic works, that afternoon, my friend called to tell me about the changes in her body she’s been enjoying drinking what she called “structured water.” This was a great “sign” and I set up a date with her to try the water from her hand-held, water treatment device she was so enthusiastic about. I now have my own water structuring device in hand and will be researching its underlying technology as well as keeping track of the changes I notice in my body. I don’t pretend to be scientific here. There’s plenty of scientific data out there already. What I offer is an intuitive perspective to balance what can be data overload. I realize I’m not making my changes in the standard scientific way. My husband, who is a Man of Science, wants me to make once change at a time so we can track what works and what doesn’t. He asked, “How can you know what’s working if you don’t introduce these changes one at a time?” My response was, “My goal is better health and my body clearly needs more than one change.” And now I’m adding a change of water to the mix, because my body asked for it. I’m not a science experiment and I don’t have a lab to track every change and deduce every reason for it, nor would I want to. If I made changes sequentially I would be once again disregarding what my body is asking for to say, “No, wait, we have to do this logically so we can cognitively gather data.” I’ve already lived that approach, which keeps me in my mind, second-guessing my body’s wisdom. You’re not a science experiment, either. So don’t let your medical team – or yourself – treat you that way. 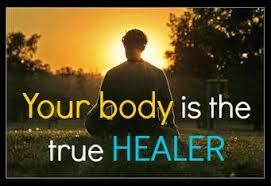 Whole-body healing doesn’t happen in orchestrated isolation. I’m not in an acute health crisis so I don’t have to be that careful. Nor am I that patient! If I were to make all the changes in sequence, meanwhile scientifically collecting all the data, it could be years before I was feeling well and I’d go nuts in the process. I was in the middle of eliminating sugar/grains/dairy from my diet AND I was ready to make water changes as well. That’s what my body asked for so that’s what I’m giving it. It’s not that complicated from an intuitive POV and it’s potentially way more effective. Even though I avoided wheat and dairy for many years, it was eliminating sugar that tipped me into balance enough that I could hear my body speaking. Of course, the balance is constantly changing. The cool thing is that we all have the potential to re-establish our internal communication system. Move as fast as it feels right. Do your own research and get support where you can. Positive healing change is available to you! P.S. Another friend just e-mailed to say she’s been completely off sugar/grains/dairy for a few months now. She said, “I can’t image life any other way now.” I agree. * Do I need to write a disclaimer here? Of course I’m not discounting modern medicine nor saying it isn’t an important healing resource. It’s often great for when your health has gotten significantly out-of-balance. My focus here is to tune inward to stay in better balance in the first place.